Look to the underfloor-air-conditioning solution that's trusted by leading organizations - like Hertz®, CitiBank®, Ford®, and MIT - for your next project. You'll find the FlexSys™ solution delivers critical benefits for LEED certification and sustainable building design: healthy indoor environment, excellent thermal comfort, acoustically quiet operation, energy efficient performance, easy maintainability, and aesthetic appearance. 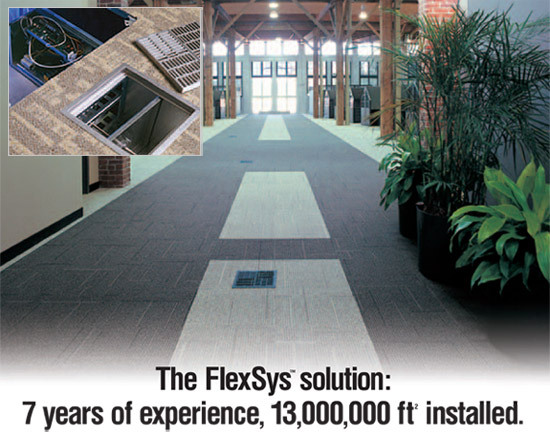 No wonder since 1997, FlexSys systems are conditioning over 13,000,000 ft of occupied space and growing! Please call your salesperson to learn how the FlexSys solution can improve the environment and operation of your facility.